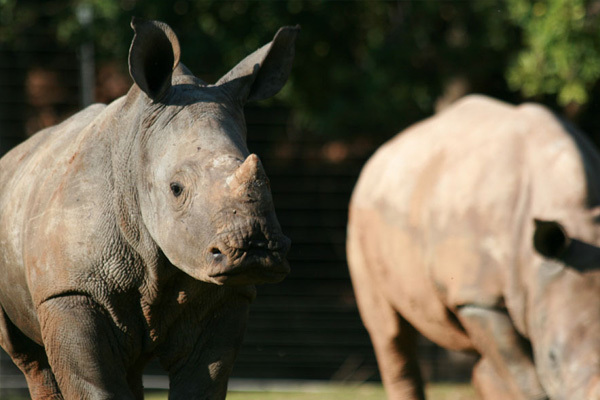 Baby Rhino Luke & Hughie at Baby Rhino Rescue | Adopt and Donate Now! When 3 rhino were poached on a farm in Limpopo, the rest of the rhinos were moved to a more secure place. The new farm was very large and the owners did not put Luke and Hughie into small camps with their mothers when the rhinos were off loaded. As a result, there was confusion amongst the rhinos and the mother’s began to run. The calves were not able to keep up with their moms who were going deeper and deeper into a new area and they became separated. Luke and Hughie were found alone, terrified, traumatized and without their mothers. Jana was called in to move them to Rhino Pride. They have taken well to the life at the sanctuary. They are still a little shy, but life has gotten better now that they have a foster mom, Rachel. She has her own baby, Hermes, but she clearly has enough love to go around, and that is lucky for Luke and Hughie.